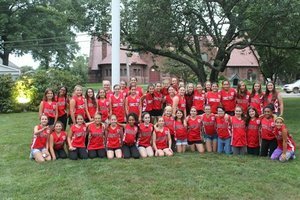 Fairfield, CT - On Friday, September 7, 2018, Fairfield held a special celebration at the Historic Town Green in front of Old Town Hall to honor the Fairfield Little League Girls Softball (FLLGS) All Stars’ unprecedented season! Town officials, including First Selectman Mike Tetreau and Parks and Recreation Assistant Director Gaylen Brown, along with members of the Fairfield State Delegation honored the FLLGS Junior All Stars, 12U All Stars, 11U All Stars and 10U All Stars with proclamations and certificates. 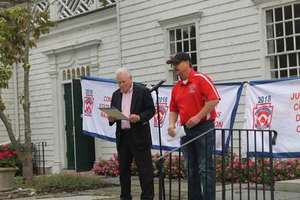 FLLGS President Dennis Nolan spoke about each team’s unwavering spirit, hard work and how proud they have made the town. Also present were coaches and managers from the four teams and proud parents. Following a brief program, the fun-filled event featured a DJ and ice cream that was generously provided by Saugatuck Sweets and served by members of the Town’s Youth Council. FLLGS has traditionally been a strong competitor in summer All-Star tournaments, but in 2018 the success of the teams from the League, was unprecedented. FLLGS entered teams in the 10U, 11U, 12U and Juniors (14U) levels and for the first time ever, all were District 2 Champions. The Junior’s team, comprised of eighth and ninth graders, competed fiercely in the State Championship three team round robin format. The team won its first two games, but fell short as the bats cooled off against Bristol in the State Championship final. The FLLGS Juniors have now competed in the State Championships for four straight years. The 10U team competed against Monroe, Trumbull, and Westport at Meyer Field in Westport. FLLGS President Dennis Nolan said, “This was a team that gelled the more they played together. After a rough start in game one, in a lopsided loss, the team proceeded to play better and better.” Ultimately, the team defeated Westport in the District Championship game. From there, the team moved onto sectionals, but lost to the eventual State Champion, the Milford team. The 11U team continued the League’s success and built on its own from 2017 when most of the players were 10 and New England Champs. It took the team three hard fought games to defeat a very talented Trumbull team and capture the District 2 banner. From there, the team moved straight to the State Championship competition facing off against five teams from throughout the State including Berlin, East Granby/Granby, East Hartford, Milford, and Wilton. The team went 4-0 against its competition and proudly brought the 11U State Championship home to Fairfield. The 12U team enjoyed the most success of all the groups this year. In total, the spirited team compiled a record of 12-2, winning District 2, Section 1, and the State of CT banners. The team was the first from Fairfield to make the Eastern Little League Softball Regional tournament since 2012. In Bristol, the 12U team faced a 10-team competition with state champions ranging from as far south as Maryland to as far north as Maine. Unlike the boys’ tournament, only one team emerges from the East; no New England and Mid-Atlantic Champions, just an East Champion. Adding to the pressure is the double elimination format, two losses and the season is finished. Fairfield Little League Girls softball is its own independent Little League program and represents the entire Town of Fairfield. It is the largest girls’ softball program in Fairfield County and one of the largest in the State of Connecticut with over 350 players participating in spring, summer, and fall seasons. The league offers levels of play from T-Ball to Juniors, spanning the ages of 6-14.